Yes, bitter melon juice is every bit as bitter as its name suggests. That’s the bad news. 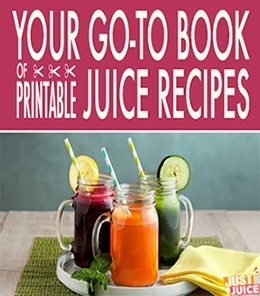 The good news is that there are bitter melon juice recipes that can cleverly disguise the taste of the bitter so you can get a good dose of this beneficial fruit without torturing your tastebuds. Bitter melon, also called bitter gourd, is a gourd grown and eaten in Asia, Africa, and the Caribbean and has been making its way to the States as well (most Chinatowns will have this wart-y green veggie). Bitter melon is eaten green – before it gets too ripe – and its fruit and seeds are used medicinally to treat a variety of ailments. You’ll understand how and why in a moment because this fruit may be bitter, but it is packed with many very unique health benefits that make it more than worth the bitter taste. It’s bitter. And with its rough, bumpy, wart-like skin, it’s pretty ugly. Yet – bitter melon is living proof that you should never judge a fruit by its cover. Because this is one of the most beneficial fruits you’ll ever sip on. The anti-tumor, anti-carcinogenic and antioxidant activity in bitter melon combats dangerous cancer cells and stops them from multiplying. 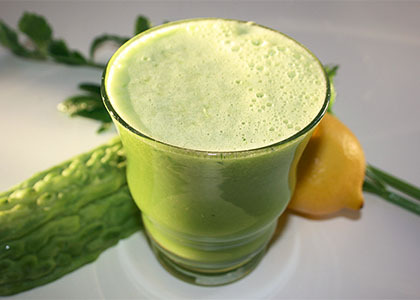 A 2013 study published in Carcinogenesis found that bitter melon juice caused apoptosis, or death of pancreatic carcinoma cells. It may also prevent the growth of other cancer cells including prostate, cervical, and breast cancer. Whether you’re dealing with sluggish digestion, intestinal parasites, a burning ulcer, or just your garden variety stomach pains like gas, bloating and constipation – bitter melon juice can help. Bitter gourd has long been used for stomach disorders and upsets, thanks to its ability to stimulate the digestive system and combat indigestion, gas, stomach pains, and constipation. But now modern research is showing that its role as a gut booster goes far beyond dealing with everyday stomach issues. For example, studies have shown that bitter melon contains natural anthelmintic agents, which are anti-parasitic compounds that help kill off intestinal parasites and works without affecting the host (i.e. you). Even more interestingly, bitter melon has been shown to contain antibacterial and antiviral properties that were shown to be effective in reducing susceptibility to infections like the h. pylori bacteria – which you may recognize as one of the main causes of stomach ulcers. And even if you are already suffering from an ulcer, bitter melon may be helpful – studies have found that bitter melon extract was successful in reducing ulcer symptoms. Bitter melon is one of the best foods you can juice for diabetes and there’s a lot of evidence backing this up, with many studies showing that bitter melon possesses powerful medicinal properties in fighting type-2 diabetes. 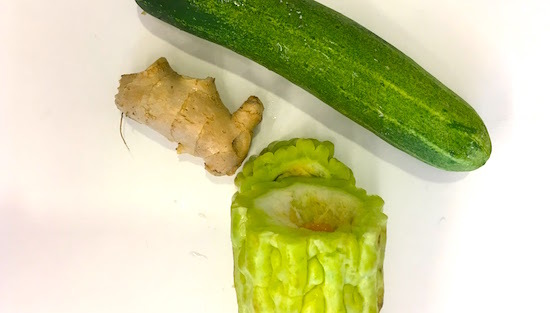 Scientists from The Garvan Institute of Medical Research were able to isolate 4 compounds from bitter melon juice that proved capable of lowering blood sugar in diabetic patients. Some of these compounds, like charntin, act like insulin to lower blood sugar levels in the body. Others activate an enzyme that’s responsible for glucose transport to the muscle cells. Bitter melon juice has also been shown to help regulate the metabolism, thereby preventing spikes and drops in insulin levels. It is now widely used as a treatment for diabetes, as it improves glucose tolerance without increasing blood insulin levels. Bitter melon is an excellent source of flavonoids such as beta-carotene, lutein, and zeaxanthin which are all excellent eye-protecting antioxidants. These antioxidants shield the eyes from light and UV damage and ward off diseases like cataracts and macular degeneration. Bitter melon reduces blood sugar as well as helps to lower cholesterol levels – both components to dangerous heart problems. Bad cholesterol clogs up arteries which can lead to a heart attack. You may have heard about the anti-obesity effects of bitter melon, thanks to an increasing number of studies which are showing that bitter melon helps correct a number of conditions that can impede weight loss, from hormone imbalance to insulin resistance. On top of that, it’s currently theorized that bitter melon is able to prevent weight gain and visceral weight mass by increasing fatty acid oxidation to stimulate fat burning in tissues. Since bitter melon contains powerful anti-inflammatory components, it can relieve pain and bleeding caused by hemorrhoids. Bitter melon also acts as a mild laxative – so bowel movements will be easier – providing relief from your hemorrhoids. Bitter melon acts as a detoxifier, cleansing the blood of toxins and enhancing liver function. It contains compounds that help in regeneration of damaged liver cells. This means that bitter melon can improve many different conditions associated with poor liver health including obesity, cardiovascular disease, headaches, digestive problems, and jaundice. Respiratory issues like asthma, bronchitis, chest cold, and cough, can all be improved through bitter melon juice. Bitter melon has anti-inflammatory, antihistamine, antiviral, and expectorant properties making it an ideal medicine for any respiratory infection or ailment. Bitter melon has been used for centuries to treat many health conditions, one of which is kidney stones. Many studies suggest that bitter melon may effectively get rid of kidney stones, improving kidney and bladder health. Bitter melon can improve all types of skin conditions including blemishes and acne (due to its blood purifying properties) and eczema and psoriasis (due to its anti-inflammatory benefits). Bitter melon is also an excellent source of vitamin C, a powerful antioxidant, which slows signs of aging like age spots and wrinkles. Bitter melon is not the sort of fruit that you juice by itself. You can, of course, but we can guarantee that your tastebuds won’t be happy about it. So having a go-to list of good bitter melon juice recipes is a must since adding other fruits and vegetables to your juicer along with the bitter melon helps cut down on the bitterness so you can have your health juice – and drink it too. Quick tip: When choosing a bitter melon, opt for a light greenish-yellow one, as the darker and riper the gourd, the more bitter it will taste. To juice a bitter melon, cut it open length-wise and scoop out the seeds with a spoon. 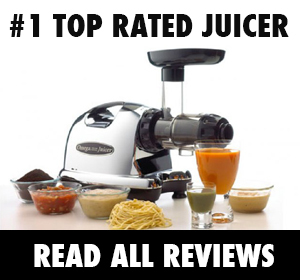 Add the outer green part of the gourd to the juicer along with your other fruits and vegetables. Oh, and keep in mind that the difference between a medicine and a poison is often as simple as dosage. So don’t drink more than one bitter melon of juice per day. Alright, ready to drink some bitter melon juice? This is not the sort of sweet and delicious juice you can sip on all day – think of it more as a medicinal liquid to drink. The taste can be quite intense, even with the help of the cucumbers, so you may want to dilute with more water. This green juice is full of antioxidants and essential nutrients for detoxification and weight-loss. 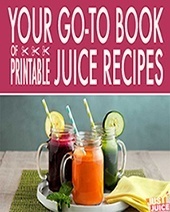 The fruits and vegetables in this low-calorie recipe also have high water content which is important for hydration and for curbing your appetite! 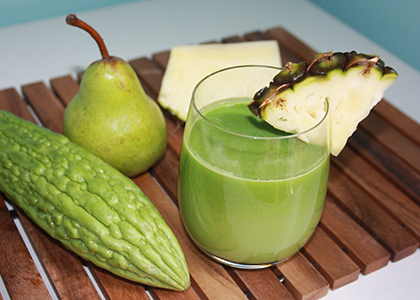 Thanks to sweet pineapple and pear, this juice recipe succeeds in dressing up that bitter melon as something rather palatable! Oh, feel free to leave the lemon out if you find the sourness of bitter melon is more than enough.